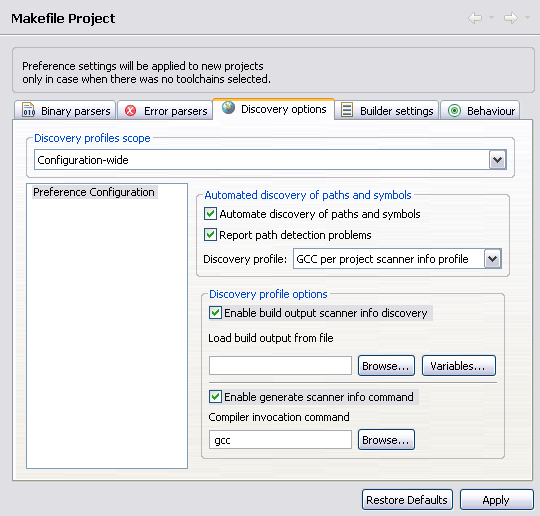 Use the Discovery Options page in the Makefile Projects preference panel to configure various options for the scanner configuration. Discovery profiles scope Define the scope as configuration-wide or per language for this profile. Automate discovery of paths and symbols Activate this checkbox to scan the build output to populate the paths and symbol tables. Report path detection problems Activate this checkbox to report all path detection problems. Discovery profile Select the discovery profile to use for paths and symbol detection. Enable build output scanner info discovery Activate this checkbox to configure the scanner to parse the output from a build. Local build output from file Click Browse to select a file from disk or click Variables to open the Select Variables window to define the build output file. Compiler invocation command Type the command that invokes the compiler, for example: gcc, or click Browse to locate it.